﻿The Hopi Flood Story is a recurring theme of the people corrupting themselves except for a few, who the god Sotuknang chooses to save to rebuild a new earth. In Frank Waters Book of the Hopi (1963) pg. 18-19 he recorded, "So corruption and war came to the Third World as it had to the others. This time Sotuknang came to Spider Woman and said, 'Something has to be done lest the people with the song in their hearts are corrupted and killed off too...I will help them. '"He then commands that he will des﻿troy the rest of the world once she has protected the ones with the song in their heart. She asks Him, "How shall I save them?" He tells her when she has traveled to where they are, "You will see these tall plants with hollow stems. Cut them down and put the people inside...she put them inside with a little water and hurusuki (white cornmeal dough)...and sealed them up." After she was done Sotuknang "loosed waters upon the earth. Waves higher than mountains rolled in upon the land. Continents broke asunder and sank below the seas...still the rains fell...they felt themselves tossed high in the air and dropping back to the water." The story goes on to say that once the movement had stopped Spider woman unsealed the reeds and the people with the song in their hearts came out to see that the world that was had perished, and that they were on a mountain, and it was all watery below. It goes on to say they sent out birds repeatedly but they returned. The people were then guided by Spider Woman to get back into reed boats and traveled over water to many islands till at last they reached the 4th world. And they went onto dry land. It should be noted that there are at least 7-9 similarities to this story and the Noah Flood Account. But there is an added section about them having to travel a long distance by reed boats, island to island, keeping the "doors open" (to their minds) to guide them to the 4th world. This could well describe the passage from the area of the Uratu Mountains to the Americas after the Flood. Petroglyph Portrayal of the Flood from Southwest US-Albuquerque ? Petroglyph meanings are usually quite subjective as there is no "rosetta stone" to help decifer them. Probably P. Schaafsma's Indian Rock Art of the Southwest (1980) has the most complete collection of petroglyphs images. But her commentary is mostly descriptive. However, it is my impression that the creators of the petroglyphs were telling a story or an event. Often there are images of what appears to be a supernatural being in association with mankind. 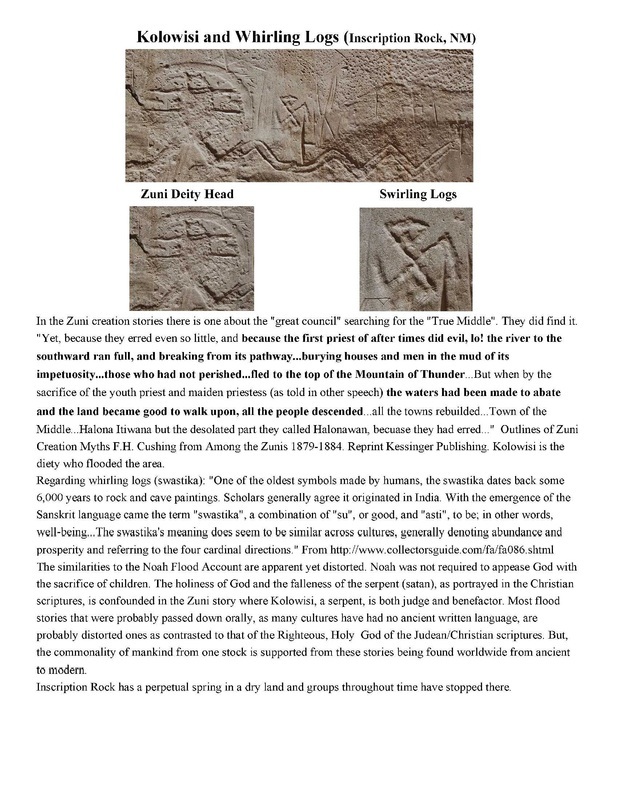 I offer the petroglyph below as a possible example of a portrayal of a Flood Account (similar to the Noah one). As the Albuquerque National Monument petroglyphs are thought to have been done by the ancestors of the local pueblo tribes, dated about 900-1100 AD, it is very possible that the creator of the petroglyph knew about the Flood. Petroglyph Portrayal of the Flood from the Southwest US-Chaco Canyon ?
" Anasazi sites in the Southwest. A small population of Basketmakers remained in the Chaco Canyon area. The broad arc of their cultural elaboration culminated around 800, during the Pueblo I Era, when they were building crescent-shaped stone complexes, each comprising four to five residential suites abutting subterranean kivas, large enclosed areas reserved for rites. Such structures characterize the Early Pueblo People. 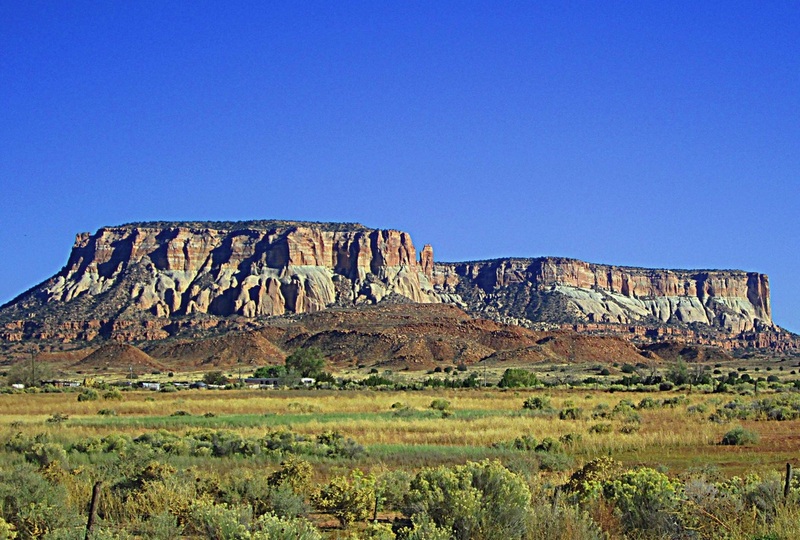 By 850, the Ancient Pueblo population—the "Anasazi", from a Ute term adopted by the Navajo denoting the "ancient ones" or "enemy ancestors"—had rapidly expanded: groups resided in larger, denser pueblos. Strong evidence attests to a canyon-wide turquoise processing and trading industry dating from the 10th century. Around then, the first section of Pueblo Bonito was built: a curved row of 50 rooms near its present north wall. The cohesive Chacoan system began unravelling around 1140, perhaps triggered by an extreme fifty-year drought that began in 1130; chronic climatic instability, including a series of severe droughts, again struck the region between 1250 and 1450." 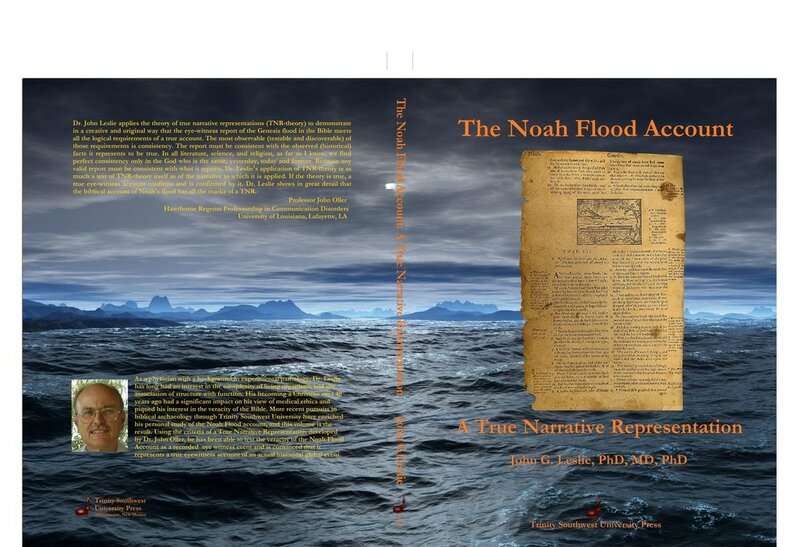 Please see the Dissertation by JGL on this website regarding the Noah Flood Account as a True Narrative Account for further flood stories from all the continents of the earth (except possibly Antarctica).